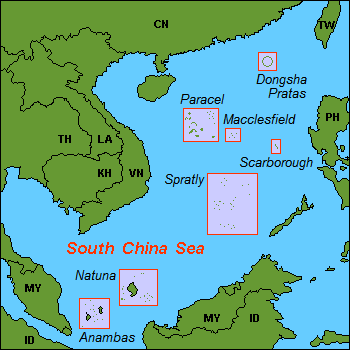 Rectangles show disputed areas in South China Sea. Philippine President Rodrigo Duterte said on Sept. 2 that China is building on another shoal in the South China Sea despite an international court ruling rejecting most of China’s claims in the resource-rich area. The Communist Party dictatorship of President Xi Jinping has been aggressively militarizing parts of the sea. A U.N.-backed tribunal has ruled in July that China’s claims to almost all of the strategic sea had no legal basis and that its construction of artificial islands in disputed waters was illegal. Mr. Duterte said he received an “unsettling” intelligence report showing China had sent barges to the contested Scarborough Shoal and had appeared to begin construction in the area for the first time. China has already built artificial islands in the Spratly chain in the South China Sea. The United States has warned of unspecified “actions” if Beijing extended its military expansion to the Scarborough Shoal. To read the Straits Times article on this, please hit this link.